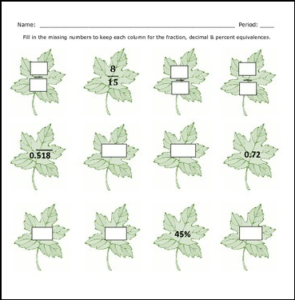 Equivalent Ratios, fraction decimal percent conversions – here are two FREE fall-themed worksheets to help students review these concepts! Use these printables as warmups, math centers, holiday activity, concept review, as sub work, with a partner or a formative assessment. A full answer key is provided. ← FREE LESSON- Boo! Eeek! Whhhoo! Ha-Ha-Ha!